Chill wine to the perfect temperature with the innovative tool. Whether the weather outside is broiling or blizzardy, the forecast for your evening is a low pressure zone with a 100% chance of perfectly chilled wine. What looks like an arctic front freezing its way through the center of your bottle is actually the innovative Corkcicle. This icicle is made of BPA-free plastic filled with a reusable freeze gel, so you don't have to worry about an early thaw diluting your wine. Simply place your Corkcicle in the freezer for at least two hours, and then insert it into any bottle of wine (after 1 glass has been poured) to maintain chilled white wine or to bring up red wines to their perfect temperature. The Corkcicle enhances the subtleties of the red and white wine's complex flavors. Made in China. 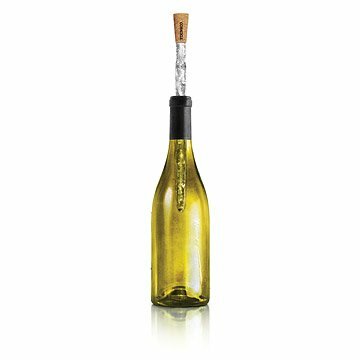 Check out our coordinating Corkcicle Wine Toppers! 12" L x 1" dia. the reusable corkcicle will maintain your already chilled white wine's temperature for approximately 45 minutes and will chill your red wine for approximately 45 minutes. This product works great, the only issue I have is that the wine does not stay chilled for a long time. Also, unless you use this frequently you'll end up spilling some wine by using this on a full bottle. As soon as we took it out of the box the top part of the cork fell off. It will still work, but kind of embarrassing to give a present that breaks right away. Great gift for wine drinkers and lovers! Had one, bought more for gifts! I use it at home to chill wine, worked so well that friends asked about it and I purchased them as gifts for some of them. Great simple design that also happens to be reasonably priced and an interesting gift for difficult to please male friends. Love it, love, love it. Will probably purchase more of them as needed. Gave as a gift to my MIL and she seemed excited to receive it. Coincidentally, was gifted one myself this year as well! I'm excited to use this to keep white wine chilled when outside or entertaining. Got this as a gift for a couple who goes through a lot of wine. They were hoping to get one, so it was well received! Great gift for all those you toast and cheer with.